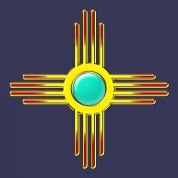 Whenever I tell people I grew up in Santa Fe, their eyes light up. They’ve either been captivated by the Land of Enchantment or they want to be. Tourism has always been a big source of revenue for the town, and its commercial, political and historical heart is the plaza downtown. 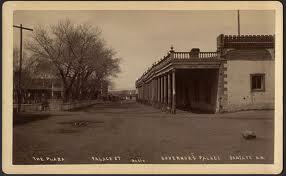 Santa Fe was the first foreign capital conquered by the U.S. Army. Thousands of soldiers entered the plaza and took possession. “Some of your priests have told you that we would ill-treat your women and brand them on the cheek. It is all false,” General Kearny said to the crowd of New Mexicans and foreigners filling the plaza (The Sandoval Sisters, chapter 22, The First White Woman). No branding, but they did put a cannon on a hill aimed at the plaza. A marker for the End of the Santa Fe trail was home base for playing tag in the plaza when I was a kid. Back then, I figured it had something to do with cowboys, but my research revealed the trail was all about trade and sales. Spain kept foreigners out for over 200 years, but Mexico welcomed trade. Wagon trains arrived regularly from the East. “ ‘¡Los carros!’ shouted women, men and boys, all anxious to get first pick of the goods as they were unloaded. Filthy teamsters yelled, ‘Aiiiie, aiiiie,’ and waved their sombreros at the horses, cows, mules and oxen, herding them into nearby corrals. The uneven wooden wheels of carretas, pulled by tiny burros, clackety-clacked on the street. Wandering pigs, goats and stray dogs added to the uproar, and the smell, of Santa Fé,” (chapter 5, A Sister For a Sister). The Palace of Governors, built in 1610, faces the plaza, and is the oldest continuously occupied public building in the U.S. It’s now a museum. As a child, I stopped in frequently to stare at the mummified baby still in its leather papoose. 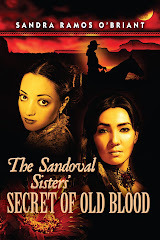 When I began my research for The Sandoval Sisters, I found a wealth of historical information there, including furnishings in use by the ricos of the time. Alas, the baby was no longer on display. Today, Native American vendors sit outside the doors to the museum selling jewelry, but in the 19th century, “Cottonwood trees planted in front of the Governor’s Palace provided shade for butchers to hang mutton, and under the covered porches of the Palace, bakers and fruit vendors displayed their produce, and Indians brought in venison and wild turkey. I’d once seen the carcass of a grizzly for sale, and bought the fatty parts. Bear grease was useful in herbal remedies; it made hair glossy black, and it lubricated everything from a baby’s rump to carriage wheels,” (Oratoria, Chapter 5). There’s a tether from my heart to Santa Fe. “I long for the comforting ring of mountains encircling Santa Fé like a vow. I want the play of light and shadow, and the subtleties of color, which only a mountain desert can produce. I need the drama of black starry night, and the passion play of electrical storms, charging even the air we breath with its energy,” (Pilar, chapter 19, Friends and Lovers). "There’s a tether from my heart to Santa Fe. “I long for the comforting ring of mountains encircling Santa Fé like a vow. I want the play of light and shadow, and the subtleties of color, which only a mountain desert can produce. 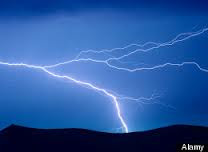 I need the drama of black starry night, and the passion play of electrical storms, charging even the air we breath with its energy,” (Pilar, chapter 19, Friends and Lovers)." Mi casa en Santa Fe es tu casa, comadre. Thank you for this beauty. You convey the ephemeral magic that is Santa Fe with poetic power. Bravo. Thank you for reading, Dawn, and taking the time to post. As you know, writers live for this. Beautifully written, Sandra. I feel like I'm there as I read your post.